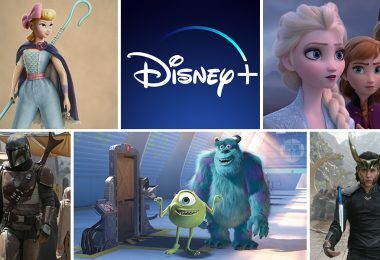 Walt Disney Archives director Becky Cline shares the history of the holiday tradition at Disneyland and Walt Disney World Resort. 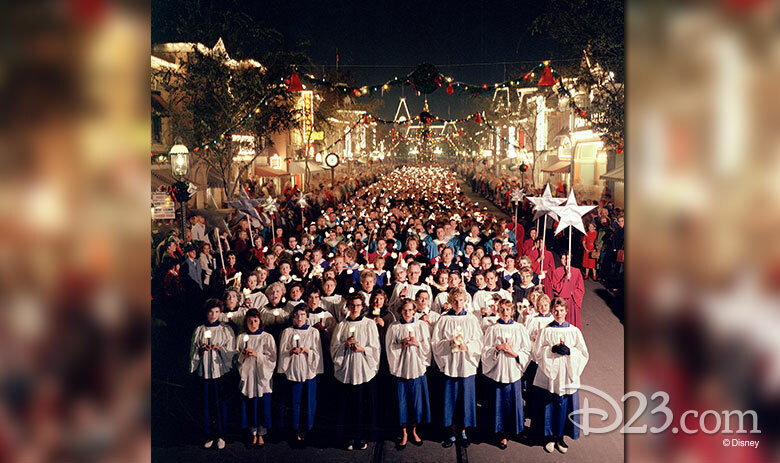 The Candlelight Procession and Ceremony is one of the oldest and most beloved traditions in the 65-year history of Disney theme parks. 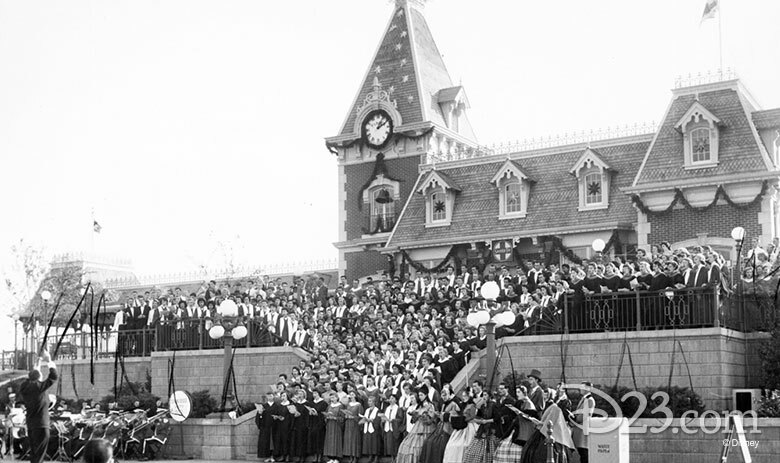 When Disneyland celebrated its first Holiday Festival in 1955, a group of 12 Dickens carolers, under the direction of Dr. Charles C. Hirt of the University of Southern California, performed throughout the park, and guest choirs were invited to perform daily in the Main Street, U.S.A. bandstand, which was re-christened the “Christmas Bowl” for the season. 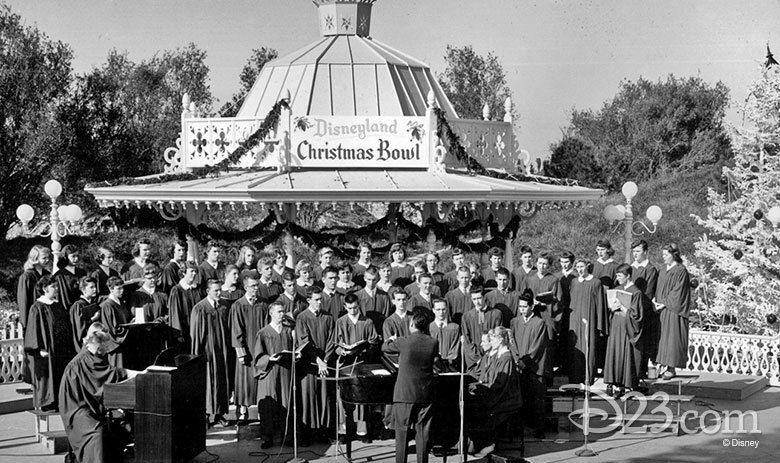 In 1960 the event was moved back to Town Square, and actor Dennis Morgan was invited to read portions of the Biblical Christmas story in between the classical hymns. 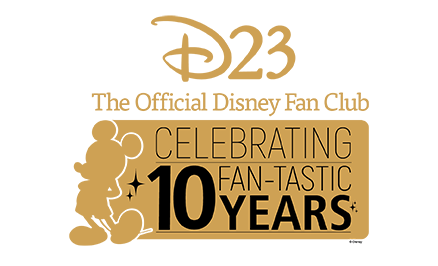 This tradition has continued with very famous celebrities including Cary Grant, John Wayne, Henry Fonda, Jimmy Stewart, Gregory Peck, Charlton Heston, James Earl Jones, Olympia Dukakis and many others donating their eloquence to the program. 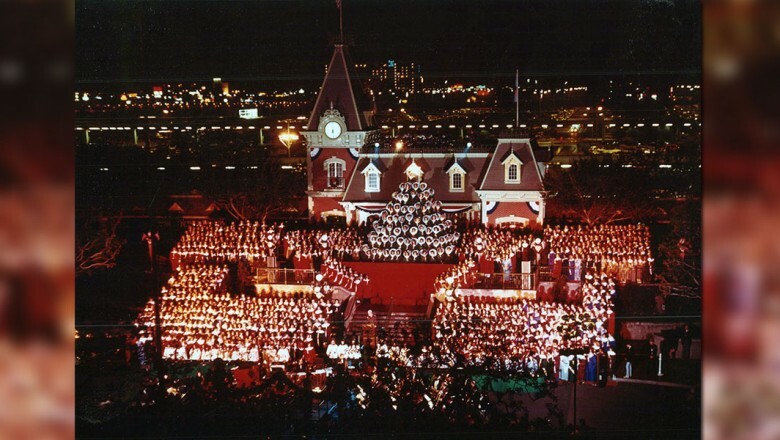 The “Living Christmas Tree,” featuring the Western High School A’Capella Choir, was also incorporated into the Candlelight Ceremony that year as a centerpiece for the massed choir ceremony. Western had presented their impressive choral program at the park for the previous two years on a specially constructed “tree” made of risers. It was so well received that they were given this annual place of honor for the next 21 years until their director, Alexander Encheff, retired in 1981. 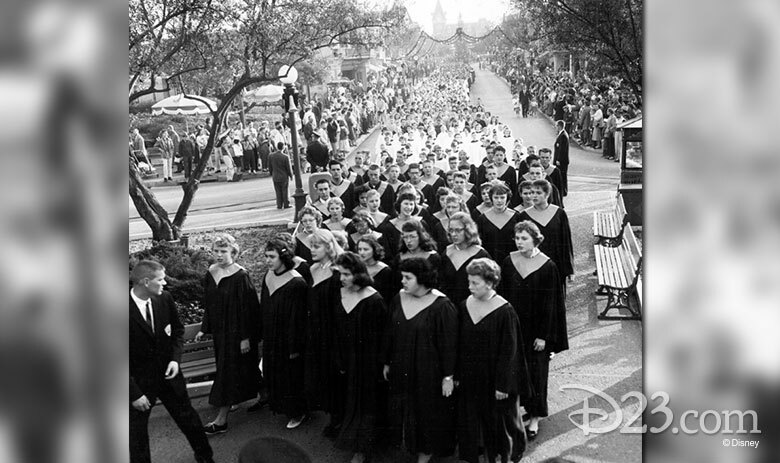 In 1982, the newly formed Disney Employee Choir (volunteer Disney cast members from the Park, Studio and Walt Disney Imagineering) was selected to fill their place, an honor they have held ever since. 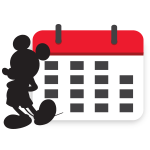 Over the years, the event has become so popular that it was also introduced at Walt Disney World’s inaugural holiday season in 1971 (starting at the Magic Kingdom, and moving to Epcot in 1994). 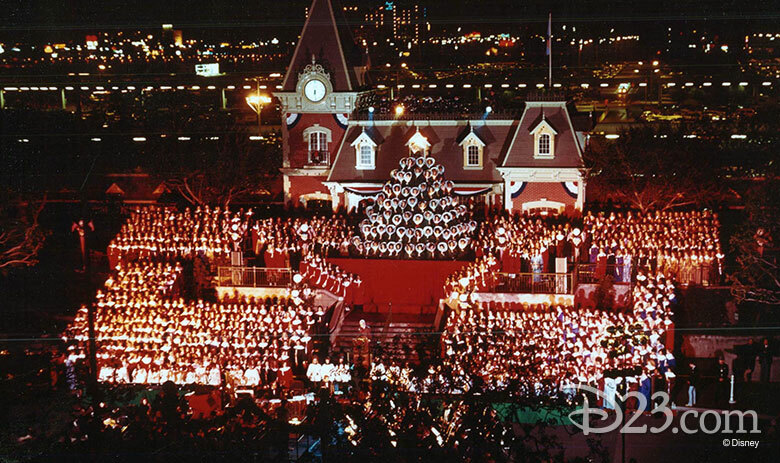 It has grown from a simple procession of candle-lit carolers into a magnificent classical concert featuring a thousand voice massed choir, “The Living Christmas Tree”, orchestra, fanfare trumpets, bell choir, soloist, sign-language interpreter, guest conductor, and celebrity narrator. 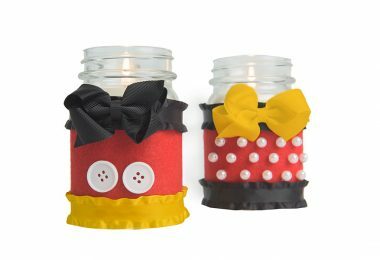 But for all of its grandeur, Disney guests particularly love Candlelight for the way it makes them feel each holiday season. Actor Howard Keel, who narrated the ceremony at both Disneyland and Walt Disney World in the 1980s, put it best. 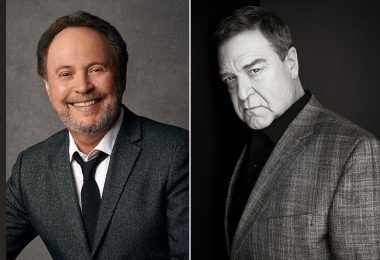 “I’ve never been a very religious person, but when you stand up there for all of those people with that incredible chorus and orchestra beside you, it’s a wonderfully moving experience.